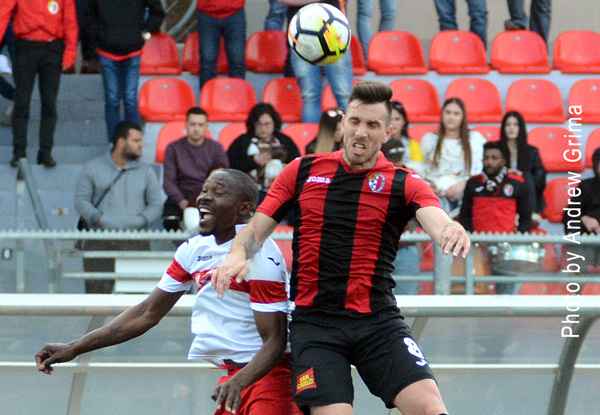 Hamrun Spartans and Balzan shared the spoils in a 1-1 draw at the National Stadium on Sunday in a clash between two of the challengers for a place in the UEFA Europa League. The result did not satisfy either side since only a win would have made real difference in the battle for fourth place. Hamrun are now alone in fourth place on 42 points, followed by Sliema on 41, Balzan 40 and Birkirkara 39. The Wanderers, however, have a game in hand and should they beat Senglea on Monday, they would move two points ahead of the Spartans. The Spartans took the lead eight minute in the second half when off a cross by Kevin Tulimieri from the right, Wilfried Domoraud headed home past Sean Mintoff. However, Balzan equalised on the hour thanks to a header by Elkin Serrano Valero following a Ricardo Calixto Correa corner from the left. HAMRUN Manuel Bartolo, Enrico Pepe, Sebastian Nayar, Wilfried Domoraud, Andre Scicluna, Conor Borg (79′ Ryan Darmanin), Marco Criaco, Karl Micallef, Orestis Nikolopoulos, Caetano Calil, Kevin Tulimieri. Subs not used: Sean Cini, Karl Luke Schembri, Matthew Robert Gauci, Cain Cutajar, Darren Debono, Ryan Darmanin, Miguel Tabone. BALZAN Sean Mintoff, Aleksandar Kosoric (82′ Sean Cipriott), Nenad Sljivic, Steve Pisani, Steve Bezzina (72′ Andrija Majdevac), Paul Fenech, Alfred Effiong, Uros Ljubomirac, Ivan Bozovic (77′ Justin Grioli), Elkin Serrano Valero, Ricardo Calixto Correa Duarte. Subs not used: Steve Sultana, Dale Camilleri, Calvin Camilleri, Michael Johnson.